Greetings oh ye painters of tiny things! 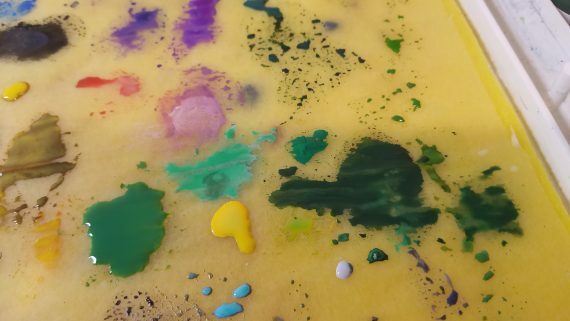 I've a fun project, nay, adventure, for those daring enough to deal with messy wet paints and those with patience to let layers dry! Indeed, a fun way of emulating marble that anybody can do with but a few simple strokes of a brush. It's also a great way to demonstrate and practice glazing. Perhaps some of you have heard of Elrik's Hobbies... 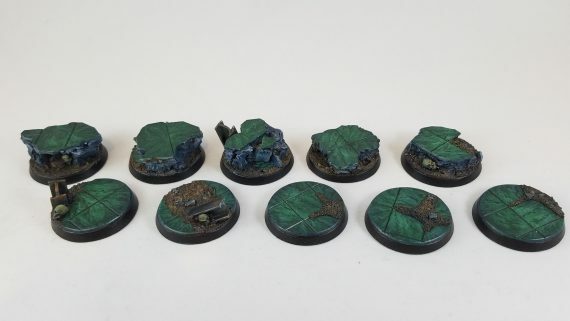 They are a seller of all sorts of scenic resin bases and supplies for hobbyists. 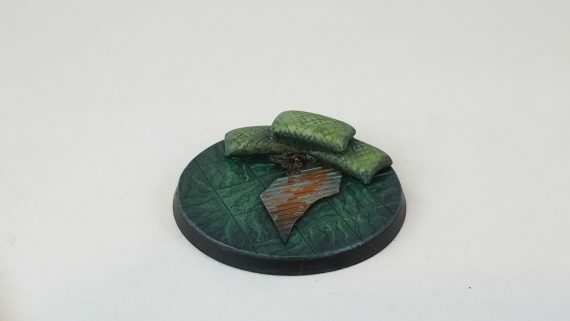 They have an impressive selection on their website, (https://elriks-hobbies.myshopify.com/) and have been present at many of the high profile midwest miniatures conventions. 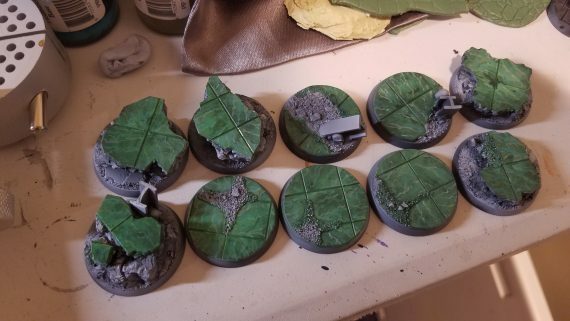 They were kind enough to donate a selection of their bases to our club so that we may experiment with them at our convenience. 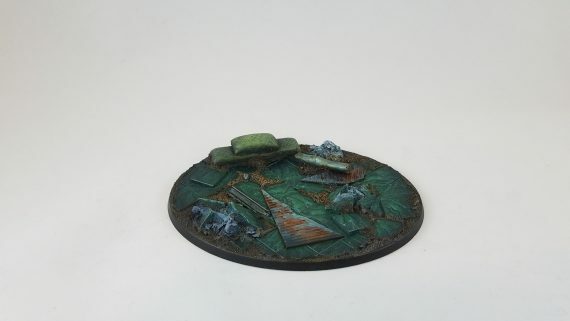 Digging through the pile, my attention was drawn towards the City Ruins bases. 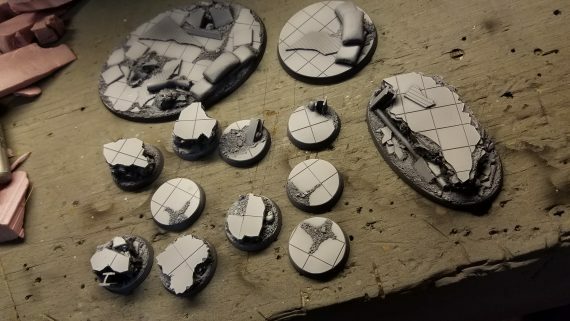 Perhaps I've had post apocalyptic games in my brain as of late, or trauma from the accumulation of so many GW miniatures over the years, but I enjoy products that give me ideas for hobby experimentation. 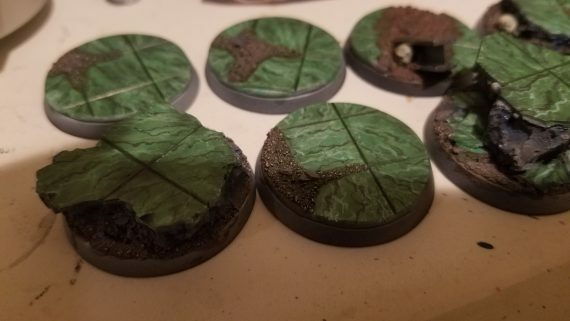 Large sized bases. The largest aimed at Imperial Knights for 40k, or a flyer perhaps. I was quite drawn to the mix of flat tile parts, along with the added dimension the ruined concrete brings. That gives an artist a lot of room to explore. Step 1: Wash & Prime. I scrubbed the bases with soap and water, just to make sure the paint would adhere. I do this mainly with resin stuff. (Some people wash metal or plastic minis, but I've never had an issue with those....resin, however...) I prime with an airbrush. Black, then zenithal highlight with gray at a 45 degree angle above, and then directly above with white. I used a bit more white for this project because I wanted the colors to be a bit more vibrant. 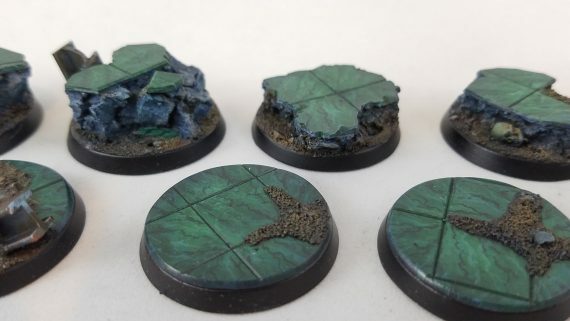 I chose to try a green/jade marble effect for the base tiles. 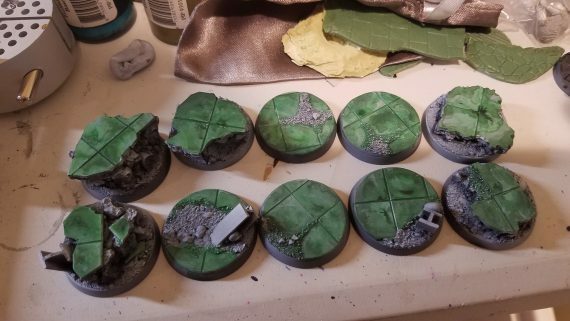 I picked a standard/forest green color, (the furthest left) and then I mixed some white with some of that green for a lighter tone, and some black for a darker tone. You can see the triad of colors in the picture. You can do this with basically any color if you want blue marble, red, etc. I added a LOT of water to the white/green and black/green colors. I wanted them to be sort of runny and usable as a glaze. Let this dry, and you'll have the effect shown below. Very interesting already! But...let's go further. 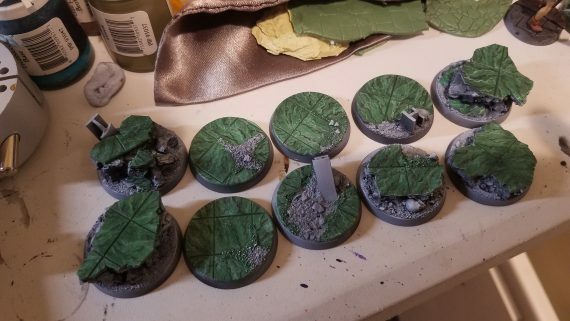 Step 4: I wanted to really bring out the green some more, so I did another layer of each of the light/dark greens in random spots. This is just saturating the colors more to get them to pop as opposed to being too muted due to the thin nature of a glaze. 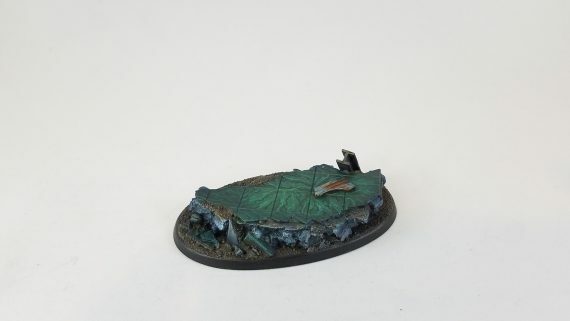 Step 5: Take a thin brush, and use some gray and some sky/arcane blue paint to make some random squiggles on the base. Almost like lightning bolts. One of the key ideas here, is that marble patterns on tiles are generally oriented randomly as they're installed. Notice how I've oriented the squiggles running in different directions on each tile. You WANT this randomness as it tricks the eye better. 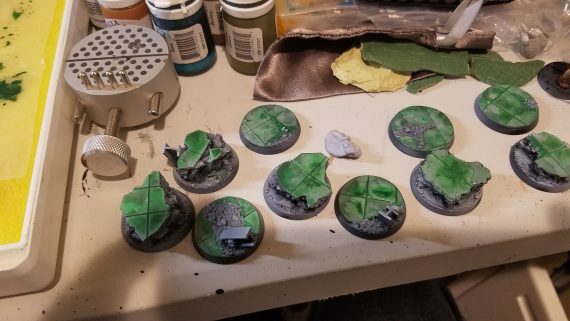 Step 6: Take some of your neutral, watered down green tone, and using side strokes with your brush, paint on a glazing layer evenly across the base tiles. 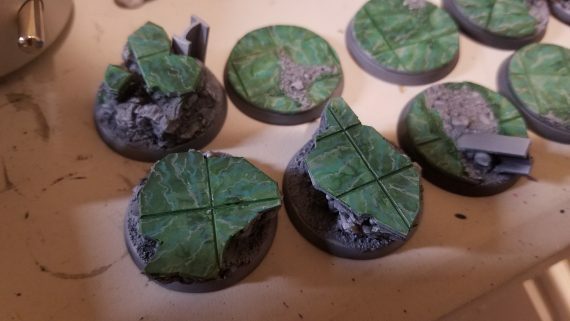 I ran my brush in the direction towards the creases between tiles so the leftover paint would be deposited in them, thus darkening them a bit. If you feel you have too much water on your brush, gently touch it to a paper towel and watch the water wick off as it gets absorbed by the paper towel. You may have more control this way. Let dry, and they should look like this. 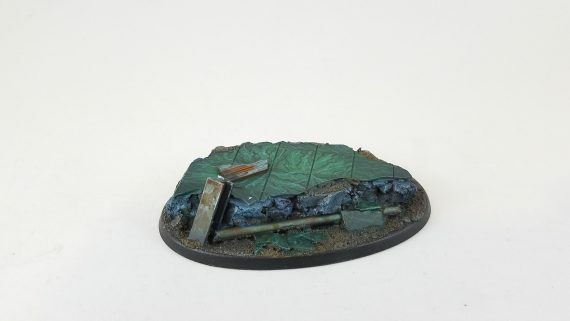 This is an amazing power of glazing with really thin paints. The glaze itself it almost translucent, so you still see the painted layer underneath, but everything is tinted green slightly. This is useful in blending transitions, creating interesting flesh tones, and unifying pieces that have too much harsh contrast. Use it! Step 7: In a similar manner to the previous squiggles, I painted some more using black and white. Very thinly, randomly, but maintaining the orientation I used for the previous squiggles. This gives even more contrast and layers to the tiles. 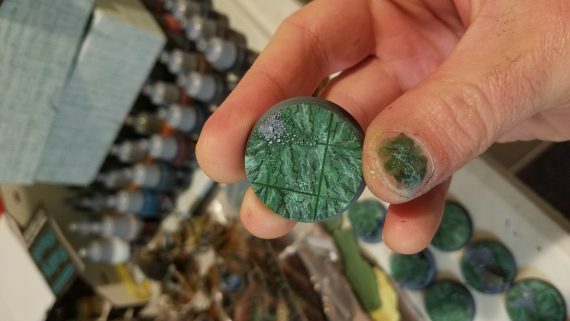 Step 8: Go back to your watered down green glaze, and put a thin layer of green to once again unify the colors a bit more. This will bury your original gray/blue squiggles a bit further, making them very subtle, but also tones down the white and black to give it a minute green overtone. It's all about fooling the eye. 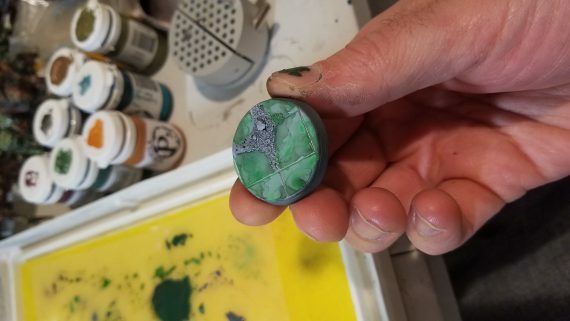 Step 9: To go even further, and increase that randomness, I mixed some of my original green with quite a bit more white. I didn't want to use pure white, as a personal general rule of painting, but I wanted it to be fairly bright. 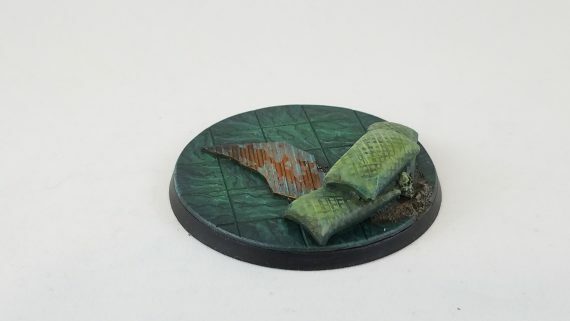 Then, I took a piece of packing foam from a miniature (the gray, spongey stuff) and I dabbed it in to the white/green paint. I ~gently~ dabbed this on randomly to the base just for some speckling. Many marble/granite tiles you see have random specks on it, and again, that randomness helps fool the eye in to thinking it's very organic. 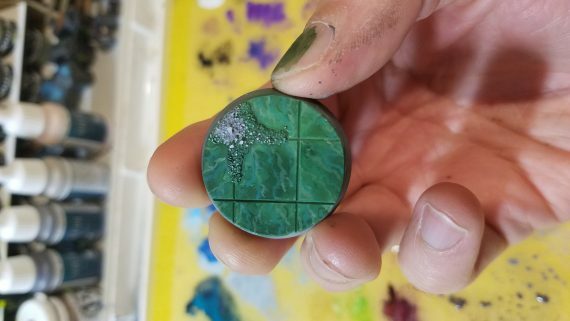 Some Final Steps: I did one final glaze of green mixed with gloss medium to tone down that speckling, create a semi-gloss finish to the tiles, and further bury my previous layers. This helps with the 3d effect and creates a better, singular piece. The glossy look also adds a bit of realism in person, something pictures don't capture well. Afterwards, I painted all of the details by hand, including the metal scraps, added some rust/verdigris, and a bit of freehand crosshatching on the fabric for interest. 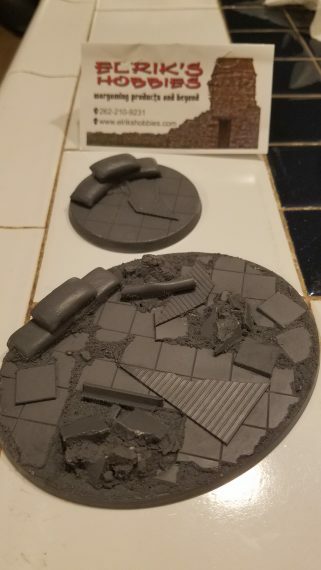 I drybrushed the dirt and rocky bits. To push it a bit further, in the end, I shaded around the brim very slightly with a dark black/blue very thinly with an airbrush. 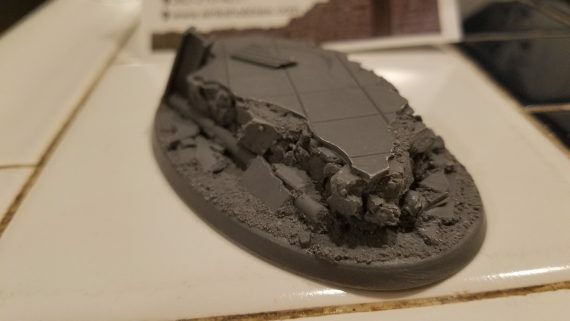 This makes the center of the base pop out like it's in a spotlight, showcasing whatever model you have mounted to it. There you have it! 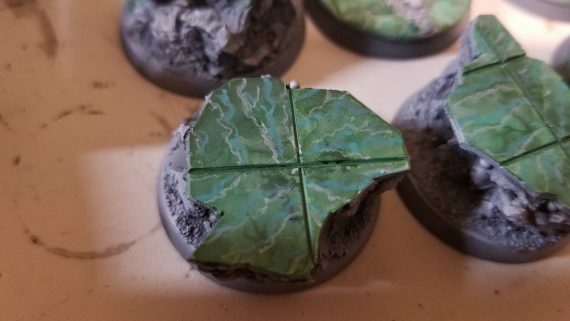 A quick and messy way to create a neat effect on your bases! 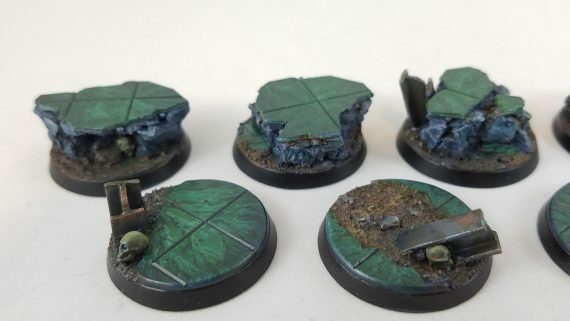 These Elrik's bases worked out great for this particular endeavor, I encourage you to check their selection out! 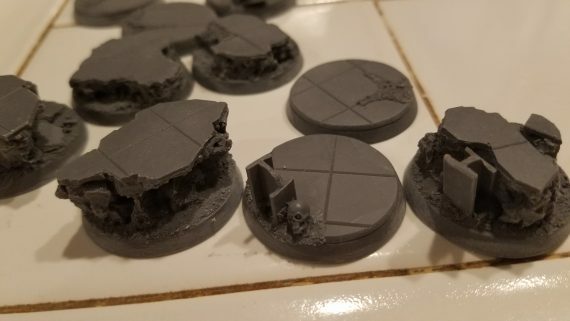 I plan on using the 32mm and biker base to mount an upcoming DeathWatch squad that I've been wanting to paint for a while. The dark, ominous green marble will be a nice compliment to their black armor. Thanks for reading. I hope this is useful. #paintbravely and stay tuned for a few more projects! This is a great article. Thanks for sharing. 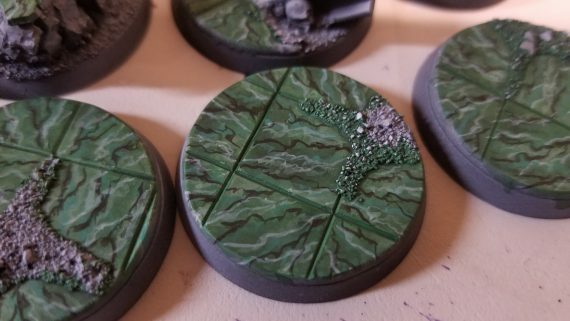 For the squiggles step, do you think a similar effect could be achieved using fine tipped paint markers or regular markers (for a softer application)? Karl, I believe pens should work fine since you’ll be adding glazing layers over them, unifying the look. I find it very easy to do with a quality fine tipped paint brush though, and as you’re varying the pressure as you pull the brush bristles along, it gives even more subtle variations in the color, something a pen may have difficulty with. I think your suggestion may be worth trying though! Most of the fun, for me, is with experimenting on this stuff. Now you’ve got me thinking. I wonder kind of effect you’d get doing it with paint pens and then hitting it with a light alcohol wash that would both tint and slightly disolve and soften the marker lines. This is a really interesting technique. 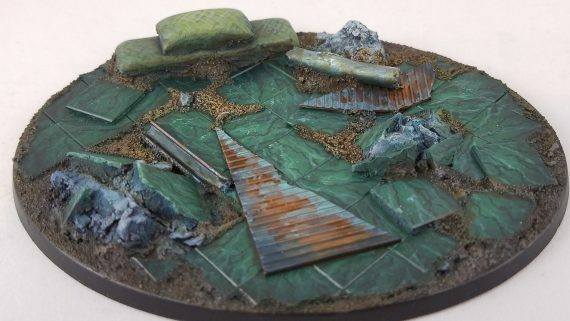 I think if I tried something similar I would probably get a bit stuck on techniques I learned for painting life sized faux marble with a feather and sponge. I don’t know if that would work at this scale, maybe I’ll try it some time. Interesting! I did use a small piece of foam as a sponging tool in one of the steps for some added randomness. 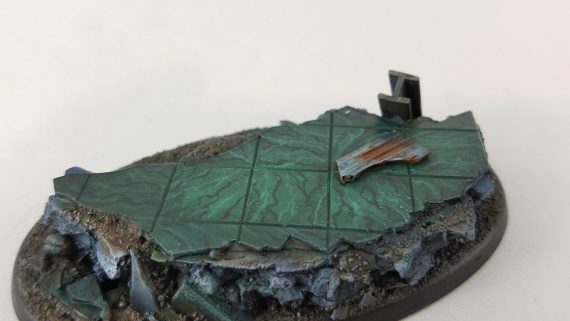 I do know that on a larger piece of terrain, you can do a lot of interesting marble effects through layering, and feathering the edges with a larger brush while the paint is still wet. 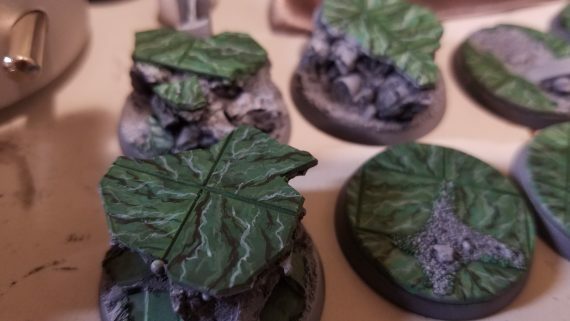 For small square base tiles like these, that technique might have been too subtle.